Sugar gliders need special cages to keep them safe and secure. Some cages can be purchased from the pet store to house your sugar glider, but you need to do a few things before welcoming your pet to their new home. Other times you may have to make your cage if you can't find one that is pre-made to buy. Regardless of where your cage comes from, you can be sure your glider will love his new home if you follow these simple steps. Buy or build a suitable cage for a sugar glider. This means the cage should be about 24 inches long by 24 inches wide by 36 inches high as a minimum for one or two sugar gliders. Of course, a larger cage is always better, but if you take your gliders out of the cage for playtime, this minimum-sized cage should be sufficient. Vertical space is extremely important to sugar gliders so that they can climb. Make sure the wire spaces on the cage are no more than one inch by half an inch wide or that the bar spacing is no more than 1/4 inch wide. A tall, large finch cage often works well, or you can carefully wrap chicken wire around the cage, making sure all sharp ends are covered, bent over, or pinched off. 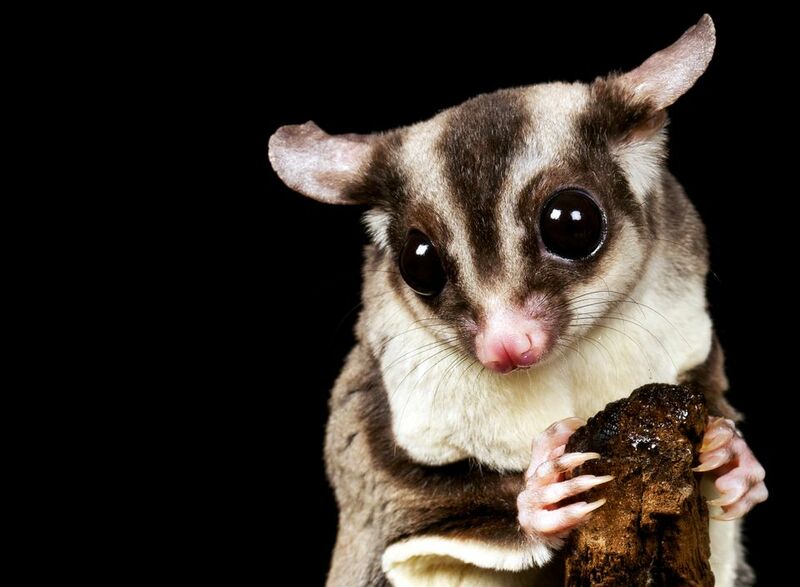 Sugar gliders can easily escape or get stuck in bar spacing that is too wide. Ensure that the cage door is large enough to fit a nest box through. Set up the cage in a quiet part of the home and on a tabletop unless the cage is very tall. Sugar gliders like to be up high. Make sure the cage is kept at 65-75 degrees Fahrenheit (18-24 degrees Celsius) and out of direct sunlight. Attach clip-on bird dishes for food and water. A water bottle can be used but provide a dish of water until you are sure that the sugar glider knows how to use it. Most pocket pets will drink more water out of a dish, so it is better to offer both if you want to use a water bottle. Put these dishes high in the cage since gliders will feel more at ease eating up high rather than closer to ground level. Add a nest box or two to the cage. These can be made of untreated wood, plastic, wicker, or a cloth pouch can be hung from the cage. Add a layer of absorbent bedding or substrate to the tray in the cage if there is a wire bottom on the cage. You do not need bedding in the nest box, but you can add a sleeping pouch or other soft cloth for your sugar glider to cuddle in. Make sure there are no loose threads or loops that the glider could get caught up in (fleece works well) and that the glider is not eating the fabric. No wood shavings should be used. Add things for your glider to climb onto like perches, branches, and ladders. Add toys to the cage. Bird toys such as hanging toys and bells can be used, provided there are no small parts that the glider could eat. A long piece of PVC pipe from the home improvement store can be added as a tunnel for playing and hiding. Add a solid surface exercise wheel (avoid wire type wheels).